With proper planning, owning a pet doesn't have to come with financial surprises. (All You) -- Keep your furry friend happy and healthy without breaking the bank. 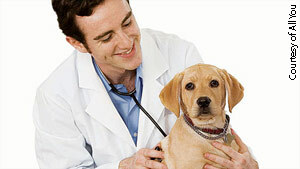 Regular vet visits are essential for your pet in order to keep up with vaccinations and detect health problems. Do a Google search or look in the Yellow Pages to see if there is a veterinary college in your area. These colleges are always in need of new patients, so they often provide discounts. If you're hurting financially, try reaching out to foundations like the American Animal Hospital Association's Helping Pets Fund (www.aahahelpingpets.org) or breed-specific rescue groups; these organizations may provide veterinary care for pet-owning families in need. It may be essential to take your dog or cat to the groomer occasionally, especially if its fur is long or curly. However, you can space out the time between visits by asking for a lesson from your vet or groomer. Have them teach you how to cut your pet's nails and explain the proper way to bathe and brush their fur. You can even use these newfound skills for other pets -- swap services with neighbors. For example, give your neighbor's dog a bath if they watch your cat while you go on vacation. You won't have to pay a pet sitter! A big money waster: purchasing small bags of food for your cat or dog. Get the largest size possible, then split the food (and cost) with pet-owning neighbors, friends or family members. As for brands, expensive price tags don't always add up to higher-quality food. Ask your vet to recommend food you can buy at the grocery store or at wholesale stores like Costco. Before you head to the vet to pick up your pet's medications, do some online research and see if you can find them for a lower cost. Check out sites like 1800PetMeds.com and print out the prices you find. Then ask your vet to match the price -- chances are, he or she will gladly do it. Getting the prescriptions from your vet is a safer choice, as they closely monitor elements like expiration dates. Plus, there are no shipping costs! If your cat or dog needs emergency medical care, you'll most likely be hit with a major bill. By spending a small amount on pet insurance each month, you'll avoid "economic euthanasia" -- having to put your pet down in lieu of an expensive surgery or treatment. The threshold of what you can spend on your pet's care skyrockets with insurance, so in an emergency you may not only save money but also your pet's life. To see if you need insurance, check out our article on finding out if pet insurance is right for you. The best money-saver out there is prevention. If your pet maintains an ideal weight, is fed high-quality food and has regular checkups, you'll avoid expensive medications and treatments. Plus, feeding and exercising your pet well will keep it happy, and who doesn't want that? Source: Dr. Marty Becker, veterinarian in Twin Falls, Idaho, and coauthor of the syndicated newspaper column "Pet Connection"